This year, 2014, marks the centenary of the First World War and many commemorations have been held in memory of those who offered up their lives in that violent struggle. 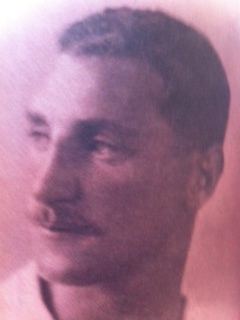 For me, this year, and October the second in particular, also marks the centenary of my father’s birth. It took place far from the fields of conflict in Concepcion in Chile where his British parents and sisters lived on a ranch called Chisuayante. Later he was to meet my mother in what was then Palestine and from there their lives together took many twists and turns, finally bringing them to the Southern Highlands in New South Wales. 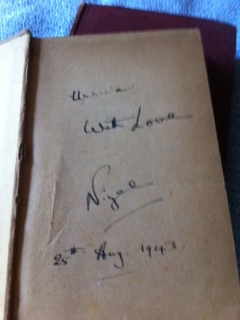 On this occasion, by way of tribute to both my parents whose souls were inseparably entwined, I thought I’d share briefly the influence that their relationship with books had on me. To begin with, no matter where we lived or how far we travelled, there was always a substantial library in our home. On the shelves could be found books awarded to my father during his boarding school years in England and brought to Australia in 1952. Those books were packed and moved umpteen times, but while other items, less valued, were discarded, given away or left behind in our moves from place to place, these few precious mementos always came with us . My father bequeathed them to my son, and until they go to his home, they sit in safekeeping although slightly ragged with age, on a bookshelf in my library. 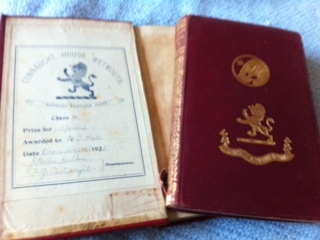 My father’s school awards were the oldest books in the family library, but it was my mother who was the truly avid reader. Over her lifetime, my mother read her way through numerous local libraries. She was partial to most genres from murder mysteries to philosophy and religion, from spy thrillers to archeological tomes, classics to joke books (Jewish humour was her favourite!). When she passed away the day before her birthday, she was reading an early gift I’d given her the week before: Wrinkles in Time – The Imprint of Creation, a non-fiction book about astrophysics, a subject of great interest that we both shared. And that wasn’t the only book she was reading at the time. She habitually read several genres at a time. In fact, it would be fair to say that my mother, whose education was interrupted by the Holocaust, educated herself through reading. Her interests were wide and her knowledge expansive. 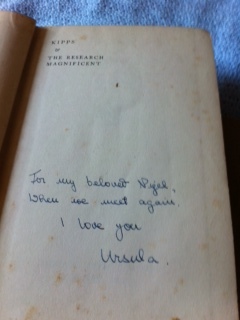 My parents often demonstrated their high regard for books by gifting them to one another. My siblings and I inherited their library. As we sorted through the numerous tomes we first opened their covers to check for loving inscriptions, and if one was discovered it was secreted away by the fortunate finder. Certain dearly-loved sisters of mine spirited away quite a haul of these gems leaving me with a mere two from very early in my parents’ relationship. Both my parents wrote as well: articles and talks later delivered in public meetings and various other forums and essays on social issues and other topics of concern. My mother wrote poetry and a radio play that was broadcast many years ago in Queensland. And right before she died, she’d begun a memoir. So my parents kept the exciting world of books opened wide for me. I’m not nearly as well-read as I would like to be, but perhaps I wouldn’t be a reader at all if they hadn’t demonstrated how highly they both valued the written word and books. How grateful I am for their legacy. Pleased you liked it, Eileen. We were so fortunate to grow up with books – and you definitely inherited the passion for them from our mother. Oh Di – what a lovely and beautifully written tribute to your parents particularly your father. i knew him briefly when he was older and he was a loving and gentle soul. My father also was an avid reader and educated himself with books. he passed his love of reading onto all three of his children. thank you for sharing this with us. Thanks so much for your feedback, Marg. We are so fortunate that our parents encouraged us to read. I can’t imagine a world without books, which has got me thinking about all the people in the world who are deprived of this benefit. Thank you, Jessie. I do feel fortunate to have those inscriptions and yes, as you say, usually when we start a book it is with the expectation that we’ll finish it at some stage; I’m currently reading Virginia Woolf’s ‘To the Lighthouse’ – it’s slow going and unless I get a wriggle on I could well expire before I reach the last page! But seriously, after my mother died and I found the book lying open on her bed, I felt a curious sense of comfort and warmth. Di, this is a moving, passionate and inspiring blog post. Your parents have passed on a beautiful gift to their children; love of books, and so much more. So nice of you to comment, Maree. I’m very appreciative of my parents’ legacy. They brought us up in a not-altogether-conventional way, but nevertheless our lives were enriched by them. What a moving testament to your parents, Diana. I love reading your posts. They’re full of your gentle warmth and passion, and from the inscriptions in the books you’ve posted here I can see where you get it from. Thank you for this touching insight into your family life. And thank you, Karen, for your lovely comments. Always appreciated and encouraging.